Cooling season is upon Chicagoland, which means it is time to make sure your clients’ condensers are in tip-top condition. Luckily, Nu-Calgon offers a full range of cooling service products that can make your life much easier this spring. And don’t forget, we’re offering special pricing on Nu-Calgon and free prizes with qualifying purchases now through June 15th, 2016! 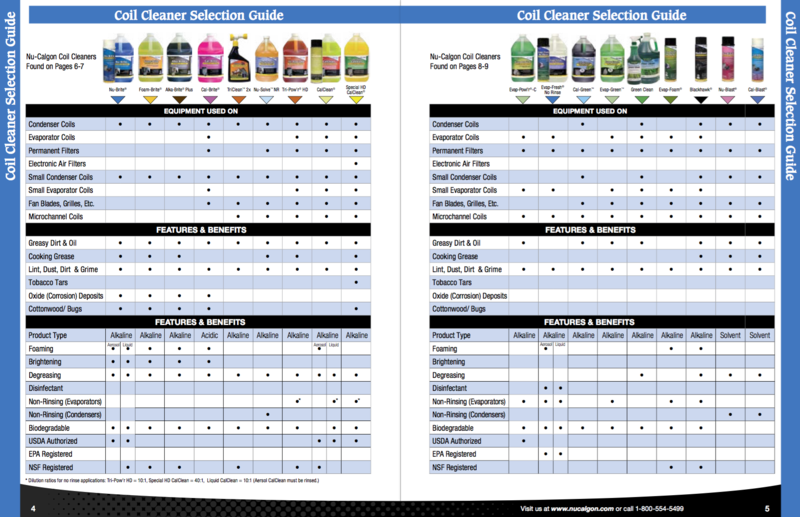 Nu-Calgon’s lineup of coil cleaners is a robust one. It can be a bit overwhelming if you don’t know what you’re looking for. But, once you’re familiar with the offerings, the variety is a strength. It makes it easy to find a product that is tailored for your specific application and not just one that will get the job done. CalClean is Nu-Calgon’s flagship condenser coil cleaner. It is a detergent-based cleanser that can be purchased in aerosol or liquid form. CalClean is tailored not just to remove grime and filth form the coil, but also to protect against corrosion and improve heat transfer. There is also a Special HD CalClean, this provides all of the benefits of CalClean with the added benefit of working on electronic air filters. CalClean is biodegradable, but if you’re looking for something that’s even more friendly for the environment, look no further than Cal-Green. This cleaner has an EPA Designed for the Environment approval and it provides all of the benefits of standard CalClean. Green Clean is also available if you are looking for an EPA Safer Choices-approved cleaner that can handle both condenser and evaporator coils. When it comes to cleaning evaporator coils, we’re big fans of Evap-Foam. This convenient no-rinse spray cleaner does for evaporator coils what CalClean does for condenser coils, breaking down dirt and removing it. Evap-Fresh is another great choice. Available in liquid and aerosol form, this product is focused on disinfecting evaporator coils and protecting against troublesome organisms. This Evap-Foam, Evap-Fresh does not require rinsing. Nu-Calgon also has a green option for evaporator coil cleaning: Evap-Green. Like Cal-Green, this cleaner earns a Designed for the Environment designation from the EPA. Finally, there is Evap Pow’r-C. This powerful product was formulated with indoor evaporator coils in mind. It is designed specifically to fight the types of dirt and debris that are found in indoor applications. Nu-Calgon still has a few tricks up their sleeve if nothing above piques your curiosity. Nu-Blast, for example, is an aerosol condenser coil cleaner that utilizes a high-pressure nozzle to agitate and displace caked-on dirt. If you’re in need of a product designed specifically for finned outdoor coils, then check out Nu-Brite. Available in liquid and aerosol formats, this alkaline-based cleaner using foaming detergents to ensure that every crevice on the coil is sparkling clean. Tri-Pow’r HD is for contractors looking for a do-it-all cleaner. This solution can be used on condenser and evaporator coils, permanent filters, fan blades, and even motors. There is also TriClean 2x, which was specifically formulated for use during annual maintenance visits. Finally, for your mini split customers, there is the CompleteCare Mini Split Kit. This kit contains Evap-Fresh and a PurCool Green Mini Strip to treat the drain pan. 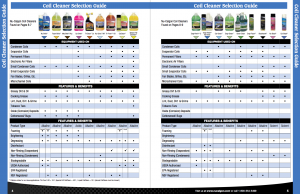 Below is a cross-reference of the capabilities and compatibilities of Nu-Calgon’s cleaners. Cleaning coils isn’t all that you can do with Nu-Calgon; they also have top-notch options for sealing and lubricating air conditioners. A/C Re-New is a condenser lubricant that is blended with the unit’s oil. For the life of the oil, it provides a number of helpful benefits to the cooling system. A/C Re-New reduces condenser noise, electricity usage, and emissions. If you haven’t used Re-New before, this cooling season makes the perfect time to start! While you’re servicing the condenser, be sure to check for leaks! Just because your customer hasn’t reported anything wrong, doesn’t mean that there isn’t a leak. Luckily, if you do happen to find one, Nu-Calgon A/C EasySeal lives up to its name. This sealant is one of the most user-friendly sealants available. EasySeal works on condensers and evaporator coils, soldered joints, and copper line sets. Just add EasySeal to the refrigerant, and it will automatically activate when it comes into contacts with moisture and air at the site of the leak. Cooling season is usually a hectic time for contractors, but with Nu-Calgon’s help, you can service systems quickly without compromising on the quality of your work. For more info on the products discussed above, just check out the literature below or ask your salesperson next time you stop by one of our branches! I heard about nu calgon before. Thanks for sharing.